And now news of the biggest yacht sold last month as Inigo Nicholson at Engel & Volkers in Madrid tells me that he closed the sale of CRN's 72m motor yacht Clarena II on April 30th, with no other brokers involved. Launched as recently as September 2009, this is the largest superyacht built by CRN and, after some modifications will, says Inigo, be delivered to her new owners in June 2010. Clarena II was built to a design by Nuvolari Lenard and is Lloyds classed and MCA compliant, sleeping 12 guests in a master suite and five double staterooms. Twin Caterpillar 2682hp engines give her a cruising speed of 15 knots and a range of 6,000 nautical miles. 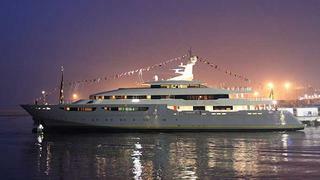 Her asking price was €58 million.